Award recipients pose with Delaware County Sheriff Russell Martin on Friday. From left to right: Civilian Employee of the Year, Angie Dusthimer; Deputy of the Year, Brandon Hunter; Sheriff Russell Martin; and Corrections Officer of the Year, Shawn Salyer. Dispatcher of the Year Erin Mann poses with her award on Monday. Mann was unable to attend the awards ceremony because she was working at the dispatch center at the time. The Delaware County Sheriff’s Office recently held its annual awards ceremony and honored civilian, dispatcher, deputy, and corrections officer of the year. The Civilian Employee of the Year award was given to Jail Classification Clerk Angie Dusthimer, who has been with the DCSO for nine years. Delaware County Sheriff Russell Martin said Dusthimer is “the ultimate team player” and said she was nominated by multiple co-workers. Martin said Dusthimer played a significant role with the jail inspection process last year and helped revise policies and the jail handbook. 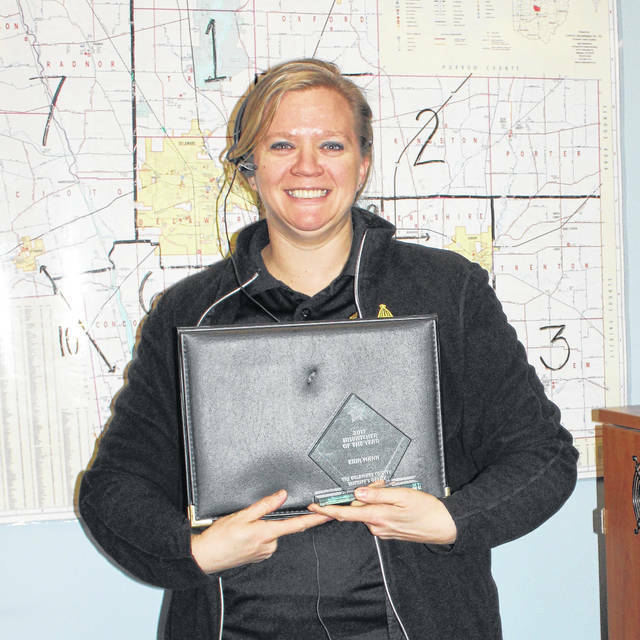 The Dispatcher of the Year award was given to Dispatcher Erin Mann, who could not attend the event Friday because she was working at the dispatch center. Martin joked there were unsuccessful “covert attempts” to get her to the awards ceremony and said he would call her after to tell her about her award. Martin said that according to a fellow dispatcher, Mann is the glue that holds second shift together on many days. The Deputy of the Year award was given to Brandon Hunter, a 10-year-veteran with the DCSO. Martin said Hunter was nominated by a sergeant and several deputies, and he said Hunter’s work and character exude excellence. According to Martin, Hunter consistently seeks out new assignments by volunteering to help out with various units at the sheriff’s office, including the Drug Task Force and Delaware Tactical Unit. Martin added that Hunter has a strong work ethic and is a top performer when it comes to officer initiated activity, which included 327 traffic stops, resulting in 59 OPS (driving without a license), eight OVIs, 75 drug arrests and multiple felony arrests. Martin also said Hunter saved two lives last year: one with Narcan and one by performing CPR. Finally, the Corrections Officer of the Year was awarded to Shawn Salyer, who has worked as a corrections officer at the Delaware County Jail for seven years. Martin said Salyer was nominated by four jail sergeants and said Salyer has served as an OIC (Officer in Charge) and FTO (Field Training Officer) because of his high level of competence, knowledge, consistency and leadership skills. Martin said Salyer has a great rapport with the occupants of the jail and knows his job inside and out.